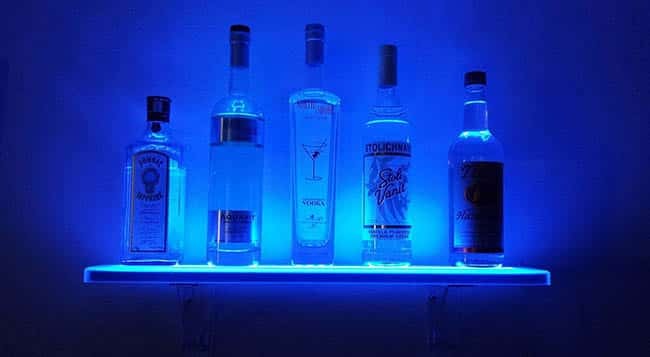 Here we share a variety of home bar ideas on a budget including some helpful tips for bar essentials and pictures of popular types. A home bar can be a great addition to your home. Whether you want to relax or entertain, it can be a unique and useful focal point. Below, we will take a look at how you can create the perfect home bar design without going overboard on your budget. Having your own bar can feel like the height of luxury. Unfortunately, many people think that this luxury comes with an equally luxurious cost. After all, not only do you have to pay to install a custom bar, you have to keep it stocked and equipped with glassware and essentials. How Do You Create a Coffee Bar? However, you don’t have to have this way of thinking. Being on a budget doesn’t mean you have to give up on home design goals such as having your own bar. Even on a budget, you still have plenty of options when it comes to creating your own stylish home bar. For more ideas check out our gallery of custom home bars or popular home bar ideas here. When you are considering a home bar on a budget, the first idea that comes to mind is downsizing from what the typical home bar would be. This is a valid option as it not only saves you money, it saves you space as well. 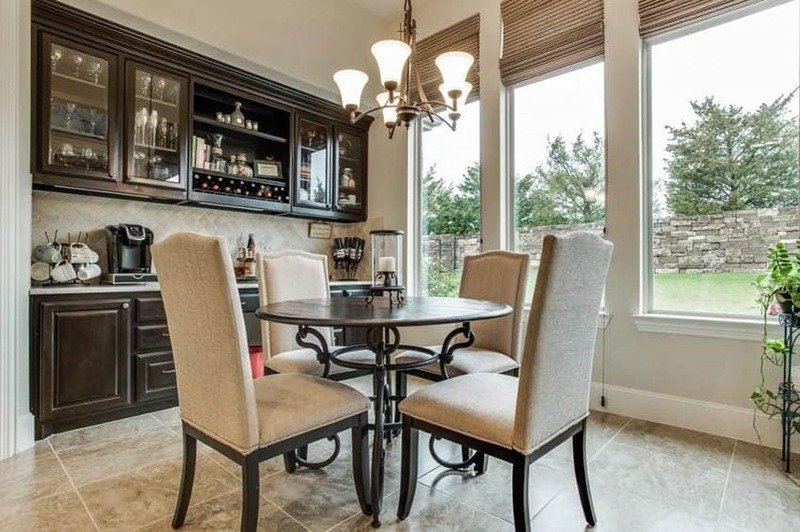 Since most people don’t need a full bar inside their homes – they simply don’t use it like a restaurant would. 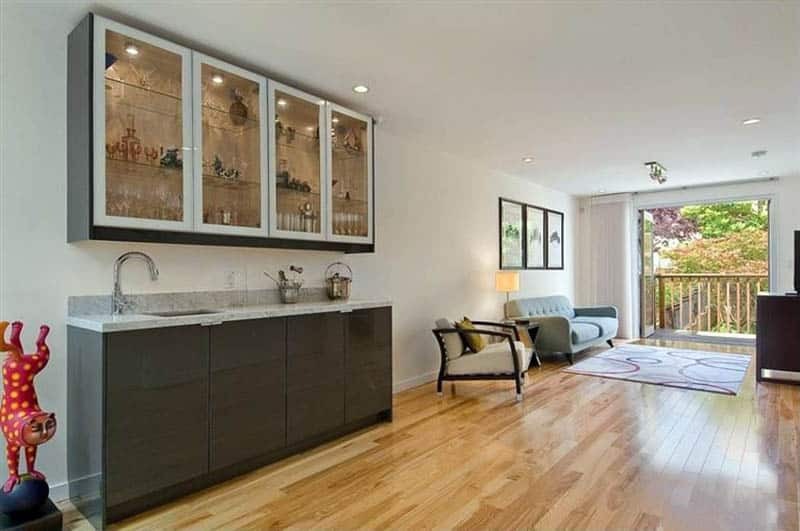 So, a small home bar doesn’t only save you money, it is also the appropriate size for most homes. First, where do you set it up? For most people, simply setting up a small bar in the corner of a room is a fair amount of space. A few shelves, cabinets, and counter space to make up the bar itself is just about the space you need. You might also want to invest in a few bar stools if you want to entertain at the bar itself. More specifically when concerning where to put your bar, though, remember that you will be using your bar, at times, to entertain others. Even when just you are using it, you will want to have it somewhere that is convenient. To fit these criteria it is usually best to keep your bar in your kitchen or living room. 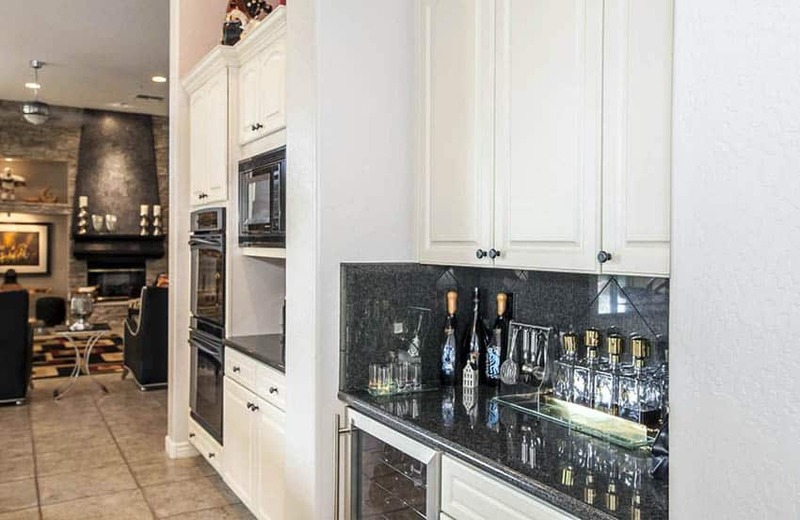 Keeping your bar in the kitchen is by far the more popular choice. Don’t feel limited by this, though. 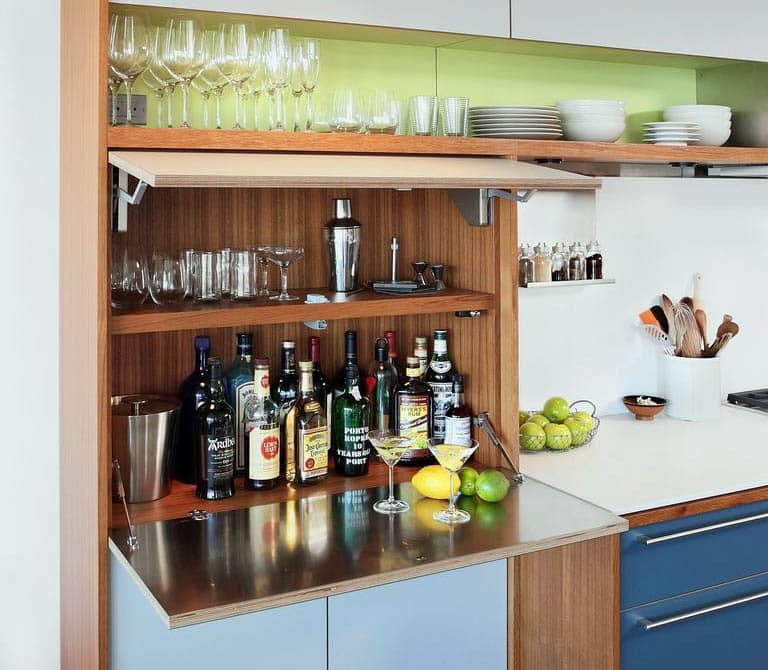 Finding the perfect spot for your small home bar is dependent on how your home is built. When you are trying to set up your bar, take into account where you have a little extra space in your house. If it fits in the corner of your kitchen, that’s perfect! However, you might also find the alcove under your stairs or a spot in your dining room work as well. Another interesting idea is to turn your home bar into a morning affair by creating a home coffee bar. This is a great idea because it is perfect if you want to make yourself a fresh cup of coffee in the morning but it also works as a great spot if you want to host brunch with family and friends. If you are on a budget, you can use the same philosophy that we discussed in the last section – make your coffee bar a manageable size. Don’t dedicate half your kitchen to a coffee bar. Instead, dedicate a corner or piece of counter space that you aren’t using. In this counterspace, you will want to set up everything that you need to fix yourself and your guests their morning coffee. What Do You Need In a Coffee Bar? So, as far as stocking a coffee bar, what do you need? There are a few essentials you should keep around. First, you should make sure that you have the essentials; a coffee maker, mugs, and, of course, coffee. Creamer and sugar are another few essentials you might want to keep around because even if you drink your coffee black, your future guests might not. You can get extras for your coffee bar if you want to as well! For example, flavored sweeteners, whipped cream, or spices like cinnamon to spice your coffee are all extras you might want. You could also keep tea in this coffee bar so it gets some use even if you aren’t in the mood for something highly caffeinated. 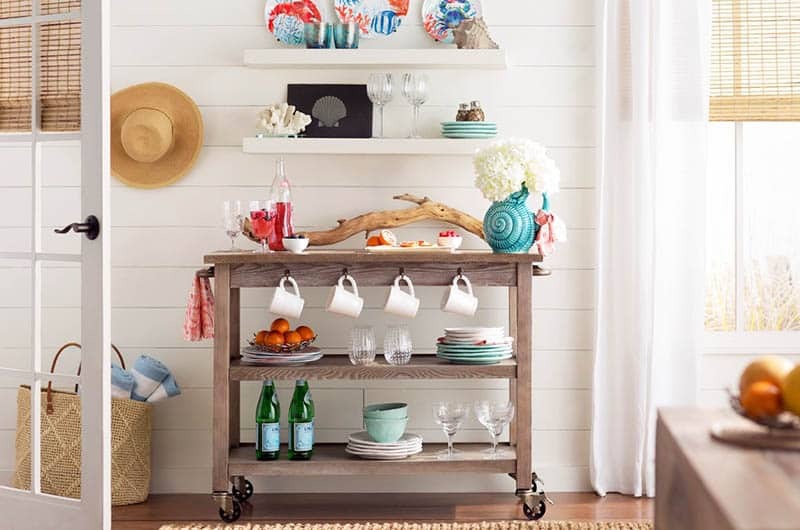 There are many portable coffee bar carts that can match your room’s style and are small enough to be pushed in to a cozy corner and brought out when needed. When most of us think of a home bar, we think of liquor, a place to sit at the end of the day to have a cocktail or a fine glass of scotch. This is only one potential picture of a home bar, though. Alternatively, you could also have a wine bar. 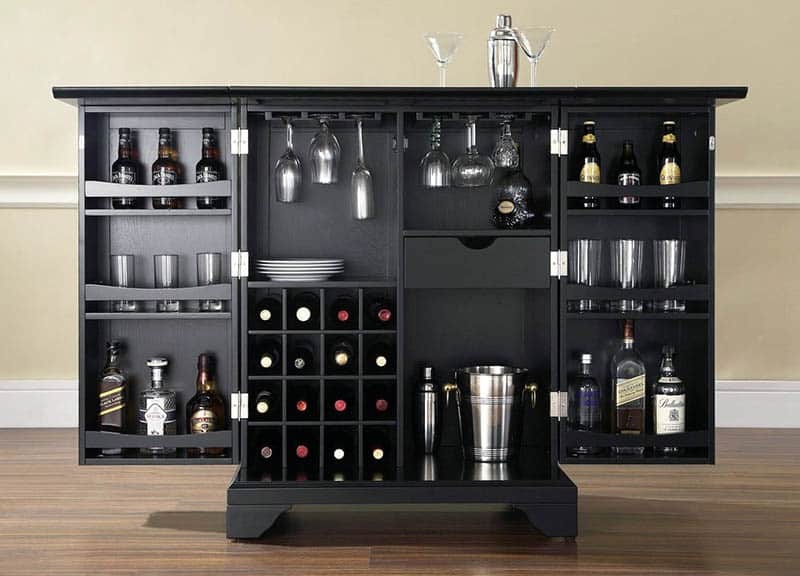 These are much the same as a standard home bar but instead of liquor, you would stock your bar with your favorite wine, glasses, opener and decanter. A home wine bar great for people who prefer to relax with a simple glass of wine rather than a cocktail. This can also be a money saving measure as well. While you might spend a bit on wine just as you would on liquor in a standard bar, you don’t have to worry about as many extras. Of course, you will need to purchase items such as wine glasses but you won’t need extra ingredients such as garnishes or mixers for the drinks you pour at a wine bar. In many cases a home wine bar uses the same build out as a traditional home bar. The only main difference would be the addition of a wine rack. This way, your wine selection is organized and properly stored within your bar. 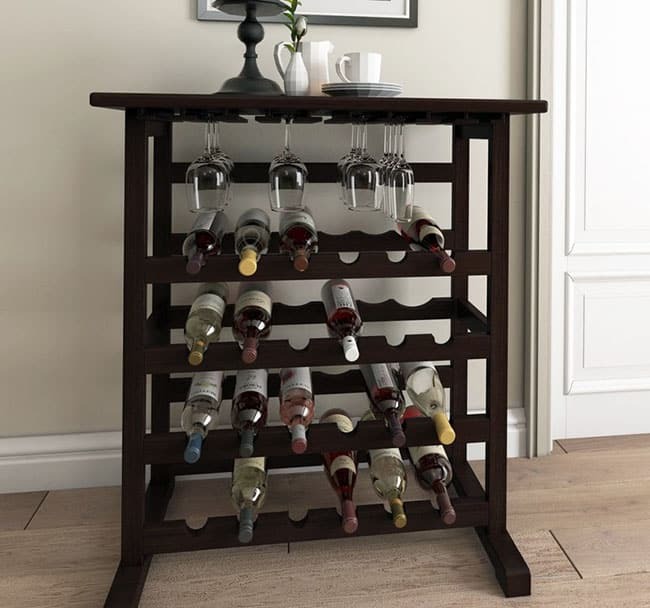 There are a large assortment of portable wine racks you can buy for the home depending on your need. Styles can vary from sleek modern models made from glass and metal to rustic wood tables with wine storage underneath. Visit this page for some of the most popular home wine bar models. There are a few essentials you’ll need to properly stock a home wine bar. For starters you’ll need a bottle opener. These range from the cheap plastic/metal cockscrew models to a lever system opener such as the Rabbit. Having a good quality opener will help you look a little cooler opening a bottle in front of friends or family. Next, you’ll want to pick up some decent stemware. Stem glasses can be stored by hanging them upside down from a rack. In addition they help keep your wine colder longer than other types which can be warmed in your hand. A set of stemless glasses is a good idea for those who want to try and avoid the inevitable spin and make a more versatile choice for casual parties. When selecting glasses a narrow wine flute is best for white wines which reduces the surface area of exposed wine to prevent oxidation and help preserve the chill. Red wines on the other hand are best served with a wider bowl enabling one to enjoy a wine’s aroma and promote oxidation. A tapered wine glass can be great to help enhance sniffing the wine while still keeping the aroma at the top of the glass. Other items in a well stock wine bar include a decanter, aerator, towels, stoppers and of course your favorite wine. A decanter allows a wine to breathe and effectively aerate the wine as well as let the wine’s sediment settle to the bottom of the glassware. An aerator can be used to inject air into red wine like a decanter and is especially useful for red wines to enhance the flavor. Towels are useful for cleaning up drips while opening or pouring wine. One thing that can make the difference between a good home bar and a more disorganized one is having storage space that fits your home bar. 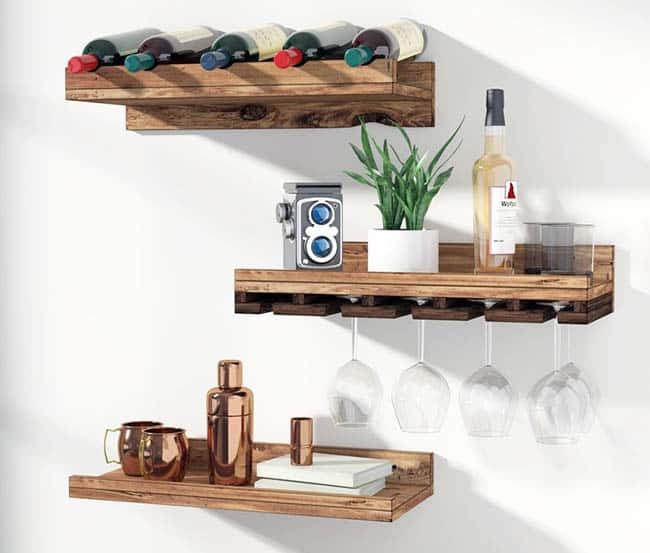 An option that is perfect for almost anyone’s home bar, though, is shelves. For most people, most of their shelf space in a bar belongs in cabinets or under the bar itself. These built-in shelves are extremely convenient and don’t usually require any extra working on your part. However, it can be extremely helpful and even give your bar a unique look if you add some shelving of your own. There are a few ways that you can add shelving. The easiest way is to create shelves that stick out from the wall. You can get more creative than a basic shelf, though. For instance, you could create shelves that are inlaid in the wall rather than sticking out. 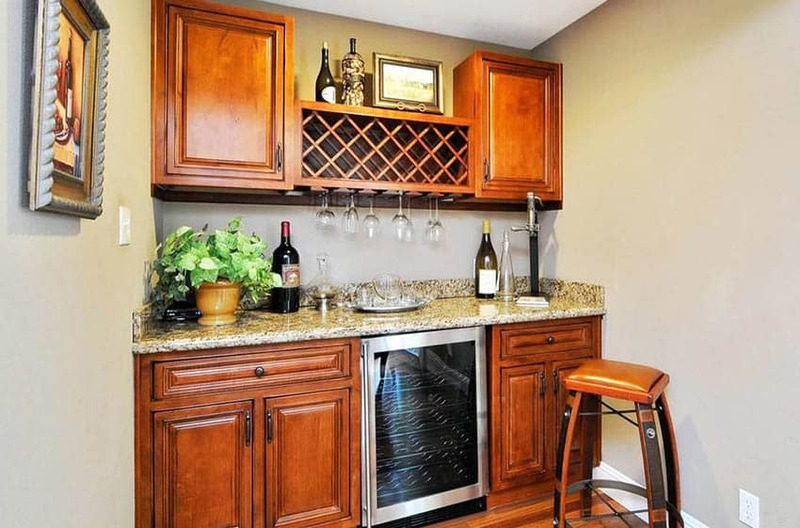 Like we mentioned before, you could even add a wine rack to your home bar for something a little different. 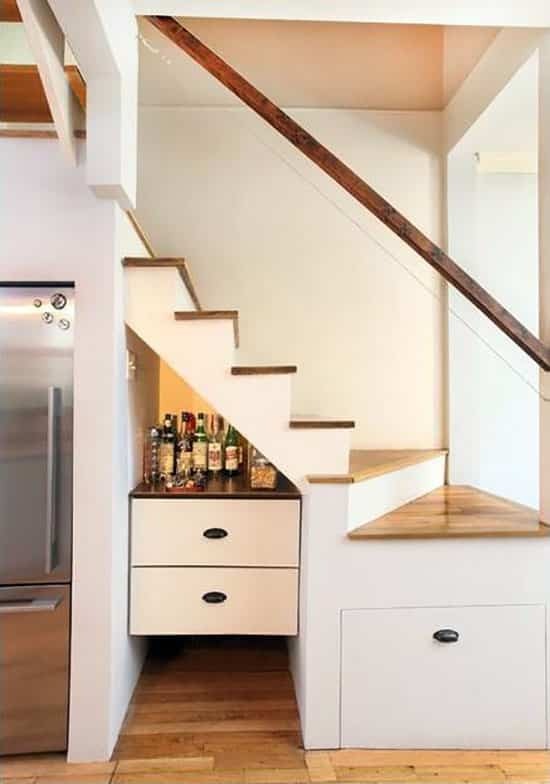 Much like the other design aspects of your home bar, coming up with storage and shelving is a chance to be creative. By creating something unique, you’re giving yourself a home bar that only you have. Of course, your home bar doesn’t mean much if you don’t have it stocked properly. Unfortunately, this can be daunting to many people. After all, isn’t the upkeep of your home bar the most expensive part of having a home bar? Actually, you can keep your bar stocked for a fair budget if you know a few basic rules. First, only buy what you’ll use. For instance, if you favor whiskey, spend your money on whiskey. Don’t go out and buy bottles and bottles of vodka if you aren’t going to drink it. At that point, you’ve simply wasted your money on something you may not use. Next, you should be sure to start small. Remember, you don’t have to go out the minute your bar is created and buy something to fill every shelf or make every mixed drink you’ve ever dreamed of. Start of by buying a bottle or two and move up from there. The same goes for the items in your home bar. Start with the essentials such as cups or a cocktail shaker. As you go along, you can add to your materials for making your favorite drinks such as whiskey stones. You will also want to remember to work mixers and garnish into your budget. Once again, start with the essentials and build up from there. You might only start with basic ingredients such as club soda or salt but you can build up your cabinet over time. By stocking your bar over time, you are spreading out your budget so that you are only spending a little bit of money at a time instead of trying to save up enough to a point when you can build and completely stock your bar all at once. Another thing you should keep in mind that you can balance budget and quality when you are shopping to stock your bar. Of course, you don’t want to fill your bar with poor quality drinks but you need to remember that you don’t necessarily need to buy top shelf liquor to have a quality drink. Visit this gallery to see more pictures of living room bar ideas for your home.